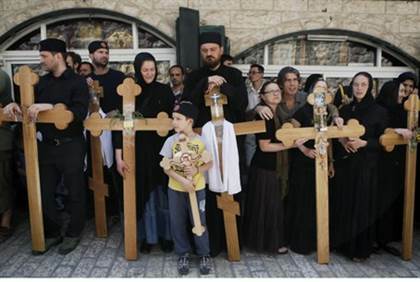 Christian Arab residents of the village of El-Khader in the Bethlehem area were savagely attacked by local Muslims as they celebrated a Christian holiday last week. A report by CAMERA, an organization which monitors anti-Israel bias in the media, reported that Christians attempting to enter Saint George’s Monastery in the village were intimidated and attacked with rocks and stones. Author Lela Gilbert, author of Saturday People, Sunday People: Israel through the Eyes of a Christian Sojourner, filed a report with CAMERA over the incident. Police did not comment, but according to Dexter Van Zile, CAMERA's Christian Media Analyst, “it seems pretty obvious that whatever police presence there was... it was insufficient to prevent an outbreak of violence, which resulted in several injuries including one broken nose. No matter how you look at it, the episode represents a failure on the part of the Palestinian Authority, one that local journalists and Christian leaders are – for understandable reasons – reluctant to highlight," Van Zile added. In a recent Op-Ed piece in the Wall Street Journal, former Israeli ambassador to the US, Michael Oren, wrote that “As 800,000 Jews were once expelled from Arab countries, so are Christians being forced from lands they've inhabited for centuries” throughout the Middle East. Citing statistics, Oren wrote that Ramallah was 90% Christian before the 1948 War of Independence and Bethlehem was 80% Christian. Today Ramallah is a large Islamic city and Bethlehem’s Christians are near extinction. El Khader, which is in the Gush Etzion region, is also a center of Muslim attacks on Jews. Cars traveling near the town are frequently attacked by Muslim youths throwing rocks and even firebombs. Rock attacks perpetrated by Arab terrorists have killed and maimed many people, including babies.